I started thinking about Eric's birthday party months ago. 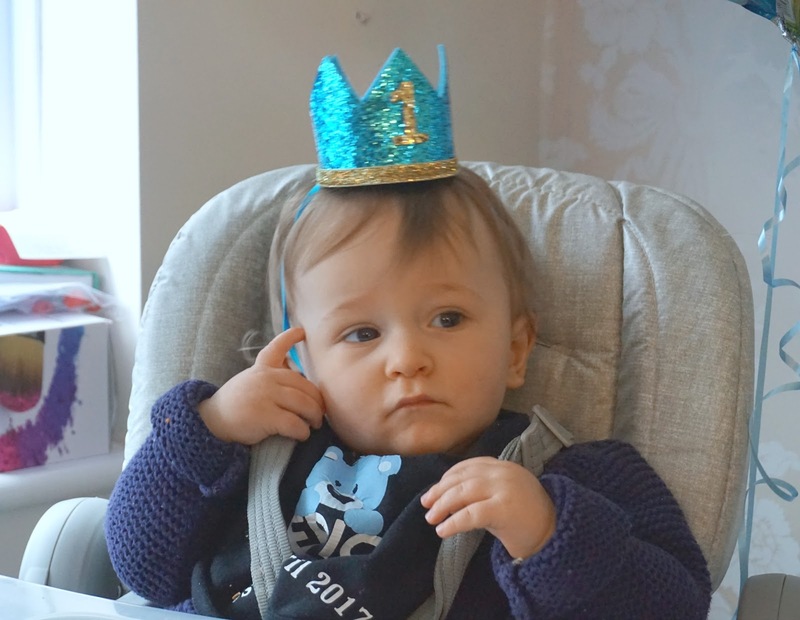 His first birthday fell at such an awkward time that dates we could hold the festivities were really slim (his birthday itself was on Easter Monday and the Grand National was scheduled for a few weeks afterwards). So we needed to fix a date and give guests enough time to book tickets and/or accommodation before prices went sky high. When it came to a theme I didn't want to do anything too over the top. Eric isn't at an age yet where he is 'obsessed' with anything and I never like things to look too fussy anyway. 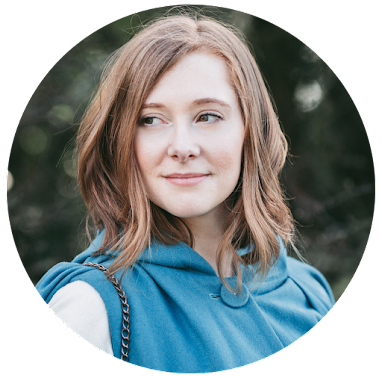 The only thing I was pretty decided on was that I wanted to incorporate a few elements that were inspired by 'The Gruffalo'. 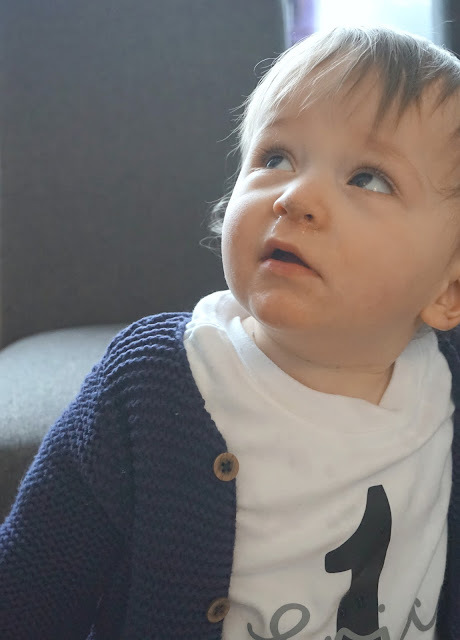 Although fickle when it comes to things he likes to watch and not really bothered by the TV, 'The Gruffalo' has always fascinated Eric and he will actually stand and watch it. So I jumped straight onto Amazon and searched for 'party packs'. Ideally I wanted something that I could order that contained all the decorations we would need so that I didn't have to hunt around for bits and pieces that all matched. 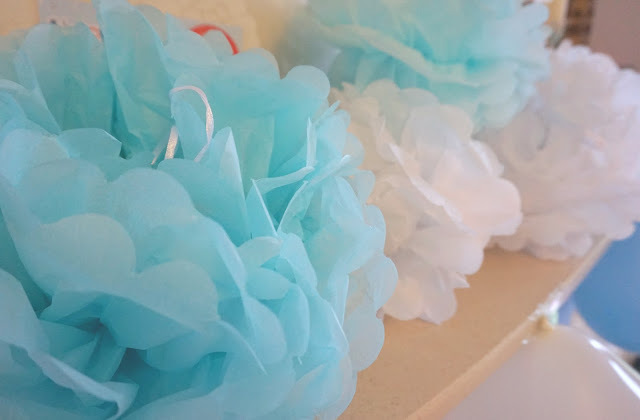 Thankfully I found exactly what I was looking for (you can check it out here), and the morning of the party me, my friend and Ryan spent an hour or so unfolding tissue paper pom-poms, blowing up balloons and threading ribbon through a DIY Happy Birthday banner. 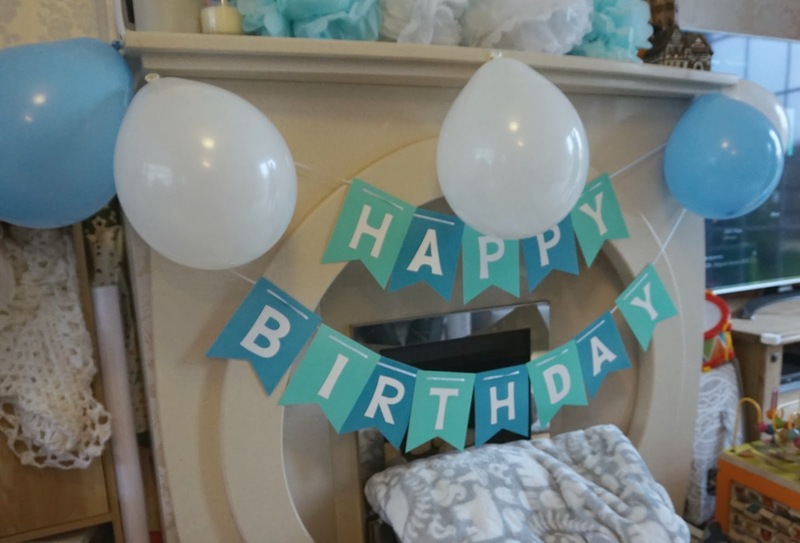 We then picked up two giant balloons from Hobby Craft (a 1 and an E) and the decorating was complete. I took the same 'as easy as possible' approach when it came to ordering party food. Nearly everything was ready-to-eat, with only a few bits needing to be cooked, and nibbles that were as baby-friendly as possible. 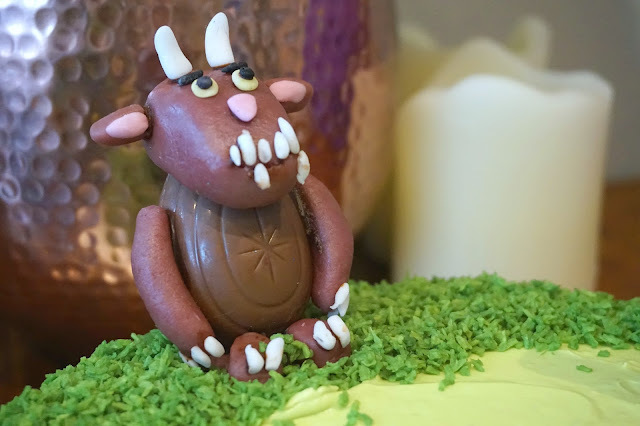 Prior to the party I reached out on social media and asked about food ideas that could be related to 'The Gruffalo' and these things were marked with a little label on the buffet table (with the actual food written underneath to avoid confusion). Eric's birthday cake was made by one of my close friends who is really talented when it comes to baking and cake decorating. She hid herself away in the kitchen the day before to tackle the majority of the cake and then finished off little elements of decoration the morning of the party. When it came to Eric's outfit I decided to treat him to something special. 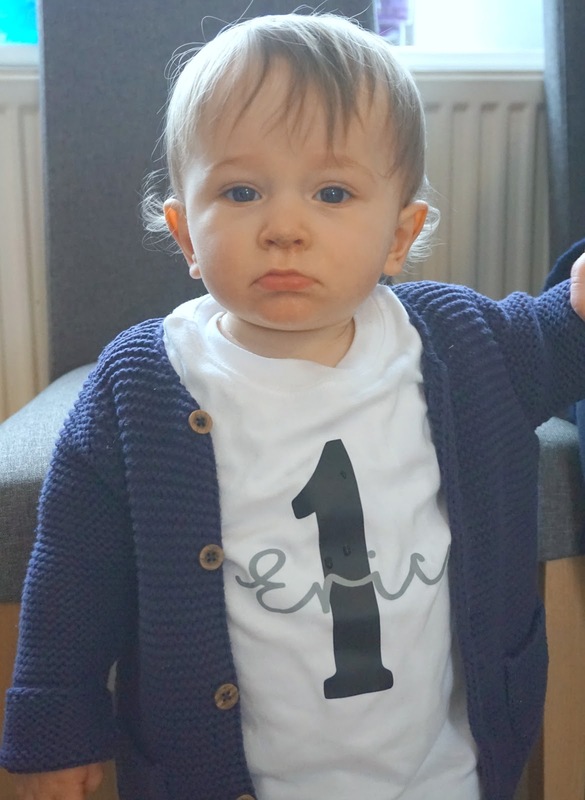 Having discovered The Monochrome Baby through somebody I follow on Instagram I put in an ordered for a personalised t-shirt. Pairing this with a pair of jeans, a cardigan and his bib from Totally Bows & Co* it meant that he was in clothes he could move freely in and stayed comfortable all day. The afternoon seemed to just fly by. The house was jam packed full of friends, family and children and everyone seemed to be having a good time which is exactly what we wanted. After nearly a week of suffering with his teeth, Eric rallied himself and lasted for the whole party without whinging or having a nap. Staying true to himself the smiles he cracked were few and far between, but you could tell he was so excited to be the centre of attention and have so many people around him. He also loved interacting with the other children that were there and watching what they were doing, even managing to sit for a photograph with all his cousins. 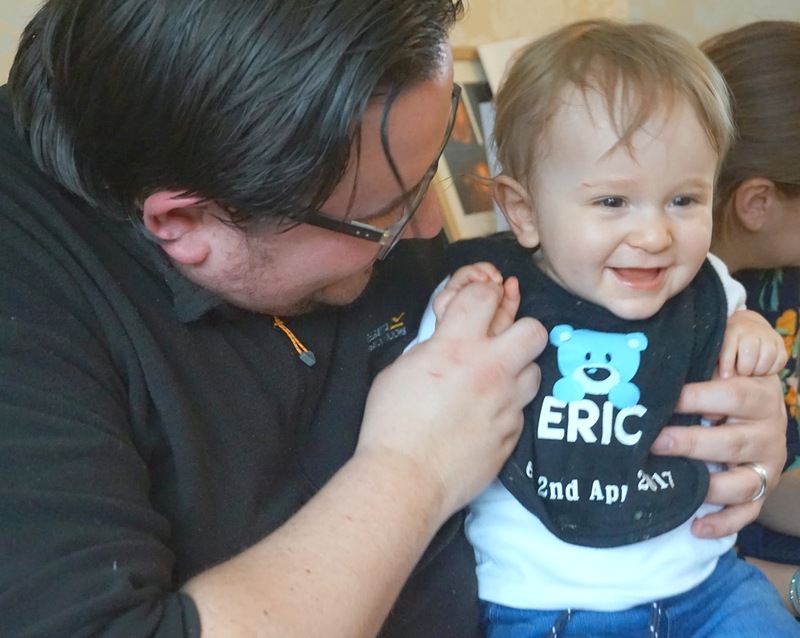 I wanted to make everyone feel as at home as possible, so we opened Eric's nursery for all our guests who had babies and young children so that if anybody needed to feed or there were any nappy changes there was a quiet place to do so. I set up the room to be as accessible and inclusive as possible, with toys, lotions, potions, wipes and books to hand that everyone was free to use. I also made a little sign for the door for anybody who was breastfeeding to stick up in case they wanted extra privacy. As everybody left they were handed a party bag to take home. It was only a little token and had a packet of sweets, a cake bar and a little 'thank you' photo postcard in it of Eric but I just wanted all our guests to go home with a little memento of the day. I did separate party bags for the children too with a few extra bits in. Not really knowing the correct etiquette when it comes to children's parties we put gifts and cards to one side and opened them when everybody had gone home. It was really overwhelming to unwrap everything and see how well our friends knew Eric or had picked up on things we had said about him because all the presents were spot on. I'm not going to lie, planning Eric's party was pretty stressful and was quite draining, but things could not have run more smoothly. There isn't a single thing I would have changed. Although we're thinking about keeping it rather low-key next year and sticking to having just a family meal. Don't get me wrong it was nice playing hostess to everyone but I am still knackered from it all now. 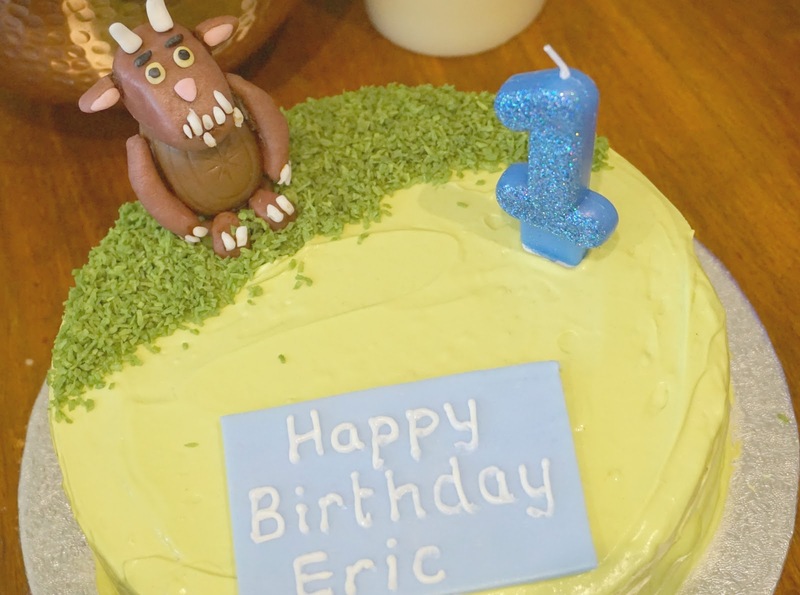 So throw in a walking, talking toddler into the mix and I think if we had a birthday party for Eric next year I'd probably have to hibernate for a week afterwards! It actually went so much better than I thought it would. Eric was so clingy to me for the days leading up to the party that I was worried he'd get really upset with too much going on but he had a great time!